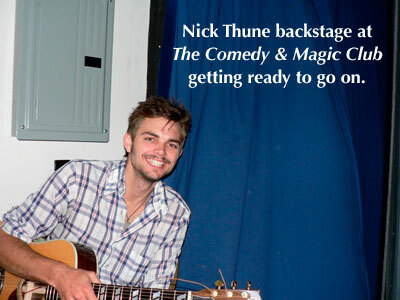 This week I spoke with the hilarious and sarcastic Nick Thune. We spoke about how the global recession is making toilets disappear, never getting a pilot to actually air on television, and how he lied to his boss to go on spring break. Andrew: If Nick Thune was interviewing Nick Thune, what question has Nick Thune never been asked that he thinks he should be asked? Nick: What's it like to be a hero? Andrew: Nick, what is it like being a hero? Nick: Thanks for asking. That was totally unexpected. Nick: Tough, I guess. A lot of people, a lot of pressure. Sometimes you don't want to let your guard down, because someone might be in danger. Andrew: Nick you just got back from Australia, are there any big noticeable differences in the culture and if so, what are they? Nick: Ok, look at it this way, this morning I woke up and I had a bloody nose. Now if I was Australian and I was to say ‘This morning I woke up and I had a bloody nose’ it would just sound like I just woke up and realized I’ve got a nose. In America, it’s basically my nose is just bleeding and it’s not even that cool. I think that’s one of the biggest differences I’ve noticed. Also, everyone always says that the water in the toilet spins a different way, I didn’t see one toilet over there. Andrew: You didn’t see a toilet? Nick: Yeah, I don’t know how anyone knows that. Andrew: If you didn’t see a toilet, how did you use the restroom? Nick: You know in third world countries, sometimes you just have to go outside. Andrew: From what I had always heard, Australia is a pretty normal place. Meaning not third world. Nick: Yeah, no, I think in the past year or so they have become a third world country. Andrew: So, this recession is worldwide. Is that what you are telling me? Nick: The recession is really affecting everybody. Yeah. There are people in Australia right now that don’t have toilets, and here I am just sitting on one in Los Angeles. Not even going to the bathroom, just because I have a toilet to sit on and I don’t have a chair. Andrew: [laughs] This question was actually e-mailed to me by a fan of yours, Richard Barrett. What is your favorite meal at the Comedy & Magic Club and why? Nick: Well, I’m glad you asked, Richard. My favorite meal is the Fillet Mignon and I always get it medium rare. I hope you write that down right, it’s actually the flaming yawn. The logo for it could be a dragon, yawning. If you guys were to put a logo on the menu. I’ve asked for it to be named after me. I’ve asked for you guys to change it to flaming yawn, but nobody does. I’m still coming to work there. I’m still coming to work for you guys. I’m humbling myself. I think that’s really big for me. Andrew: Don’t you think then if we had the flaming yawn, as you put it, with a dragon logo, wouldn’t that be awkward that we don’t have every other dish named. Nick: No, because then it is a special meal. Nick: You have a dragon next to it. It’s yawning. Then everyone is like what’s this flaming yawn. Let’s try it. Andrew: So, it’s just a way to differentiate itself on the menu. Nick: Yeah, if you want to start pushing your more expensive meals, then that’s a way to do it. You know, I guess I am not a comedy club, so I guess I don’t know if that is right or not. Andrew: Nick, I want to change the tone of this interview now. Nick: Yeah, take it down a notch. Andrew: You’ve had a lot of failed pilots, it that difficult to deal with? Nick: [laughs] Is it difficult? You know I’ve only had, let’s see four, four failed pilots. The most difficult part about a failed pilot is just the amount of money that’s in my bank account right now, because it’s too much. So, right now I am in the process of moving, because I used to live two miles from my bank. You try and drive two miles and laugh the whole way. It’s impossible. So, I just moved two blocks from my bank and I just do a run laugh. I go in there, not even out of breath, do my withdrawals, transfer money back and forth for no reason, just cause. Andrew: I think I got the point of that and I liked it. Nick: Is it ok for me to go off book for a second and say something my father reminded me of today of what I did when I was younger and I just could not believe how awesome it was. Nick: My dad got me a job, he works in the car business, he got me a job at a car dealership washing cars. I worked there for about three - four months washing cars and they had one of those off-site sales at one of those mall parking lots and so I delivered all the cars there, they were all washed and cleaned for the next day for the huge sale. I went up to the owner and I said listen all the cars are clean why don’t you let me wear one of my dad’s suits tomorrow, I was 17 at the time, and see if I can sale a car. Bam, showed up the next day, sold two cars. Never washed another car in my life. Worked there for six months as a car salesman. Still in high school, they didn’t want to give me time off to go on my spring break trip. So, five days before spring break, this is when my acting career started, I went into the owner of the dealership’s office crying and basically told him that I had HIV. Nick: I left, I told him I couldn’t work for him anymore, it’s too much. I get home that night, from hanging out, my dad comes home from work, he doesn’t look happy. He says hey I just got a call from Kirkland Nissan. Did you tell him that you have HIV? Nick: And that’s when I realized oh my gosh, my dad got me that job, so yes, dad I do have HIV, I’m sorry. I finally told him today that I don’t have HIV. It’s been 10 years. It’s a true story, except about the part about lying, my dad knew I didn’t have HIV, but I did do that to get out of a job and that kind of blew my mind. Andrew: Of all the things to say that you have, why something so dramatic? Nick: I know. My dad said how about just I quit. Have you ever thought of that? I honestly thought that it would bum them out if I quit. That’s how much I thought they liked me. So, I thought they only way to respectfully bow out of this job was with HIV. Which is the same thing Magic Johnson did with the Lakers. I’m sure other people have gotten out of other jobs that way. Andrew: [laughs] So you’re saying that there’s a chance that Magic Johnson never actually had HIV, he was just tired of playing basketball? Nick: You tell me if he’s in the best shape of his life right now or not, ok. I’m not saying anything. 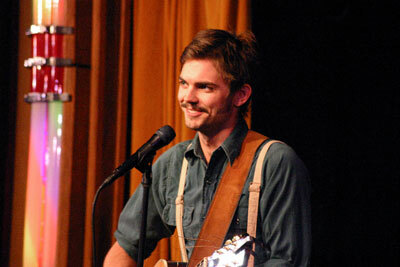 Andrew: Nick Thune for a guy with a guitar on stage, you seem like you don’t have a good singing voice. Is that why you are a comic? Nick: [laughs] I seem like I don’t. You know the reason I became a comic is because I couldn’t take myself seriously and every time I tried to, it just made myself sick a little bit. Not that I don’t like it when people do take themselves seriously on stage as musicians, I love it, but I just wasn’t one of them. When it comes to my singing voice, with my looks and my height and everything it would just be a two times quadruple threat if I could actually sing well. So, I actually have to dumb my voice down for the audience. Andrew: [laughs] They’ll storm out jealous and angry. I understand. Nick: Yeah. An octuple threat. Unless I’m in an airport, I’m totally nice, I’m a totally good guy. Andrew: It seems as though you are on the cusp of making it huge. Do you feel that way? Nick: For about the past ten years, yeah. I don’t know if I feel that way. I think sometimes it’s just buzz. It’s like a whisper, it just get’s blown away in the wind. Kind of like Wi-Fi gets blown away sometimes. If it is to windy out, you think you have a good connection in your Wi-Fi and then you look out on the patio and then bam the wind is blowing the Wi-Fi everywhere, and that’s why, I don’t mean to turn this question into an invention that I have right now, that I am promoting, but I have started selling scented Wi-Fi on my web-site. Andrew: [laughs] Another question that would was e-mailed in from James Wilk. Do you regret getting married before you got famous? Nick: [laughs] You guys crack me up. Do I regret getting married before I got famous? Oh gosh, you know I’m going to have to answer that question with another question. Does that mean that James is into me? Andrew: [laughs] What is it that you dislike about the Comedy & Magic Club’s audiences? 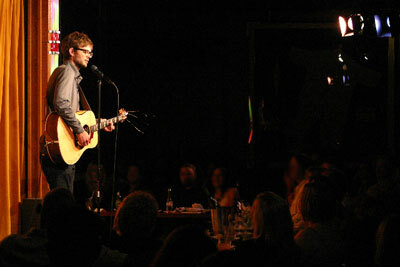 Nick: What is it I dislike about The Comedy & Magic Club’s audiences? Too good looking. Too wealthy. Too forgiving. Too kind. You know sometimes I want to get smacked around a little bit by the audience. Mentally, I don’t want any physicality, I don’t want to say anything. I just want them to mentally give me a rough time. Sometimes the audience, they come in and I don’t know how to say this the right way without making them, well, probably love me even more, but sometimes it’s just like they laugh to much and it’s frustrating. It’s frustrating because I like silence I like having to work on my feet and when they are laughing all the time it’s like, oh they like me, I’ll just say whatever I want and then they keep laughing. It’s just frustrating. I guess that’s just the career I choose and I am just going to have to keep putting up with it over there in Hermosa.